We are being published in a new design book! One of our web site has recently been selected to feature in a new design book, Market Smart Design. It will be published by Harper Collins in Spring 2009. “MARKET SMART DESIGN Great Design Examples Created Specifically For Target Markets. 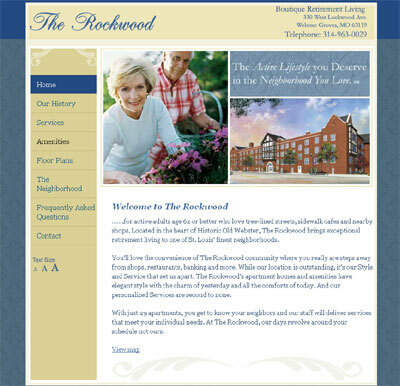 The site we created for “The Rockwood” , a senior living community, will feature in the Baby Boomers category. During the entire design process we kept a high level of focus on the target audience of the site. It features an important usability option allowing a visitor to easily adjust the size of the type on the page. We are delighted “The Rockwood” has been selected for publishing! This entry was posted in Design Snippets, Random Thoughts, Web Design Projects. Bookmark the permalink.